The steep mountain slopes and dramatic canyons of the northern reaches of Somontano made agriculture difficult in this area and also prevented the growth of large villages. As a consequence the rural environment is sparsely populated and villages are scattered across a wide area. Although rivers created an obstacle to communication, the building of bridges was not commonplace in the past. They were only built in dangerous areas or across rivers with particularly strong flowing water. Sometimes, as is the case here, the presence of a bridge was associated with a mill as crossing the river with horses laden down with cereals presented a huge risk and required some measure of safety. The Las Almunias mill is located downstream. 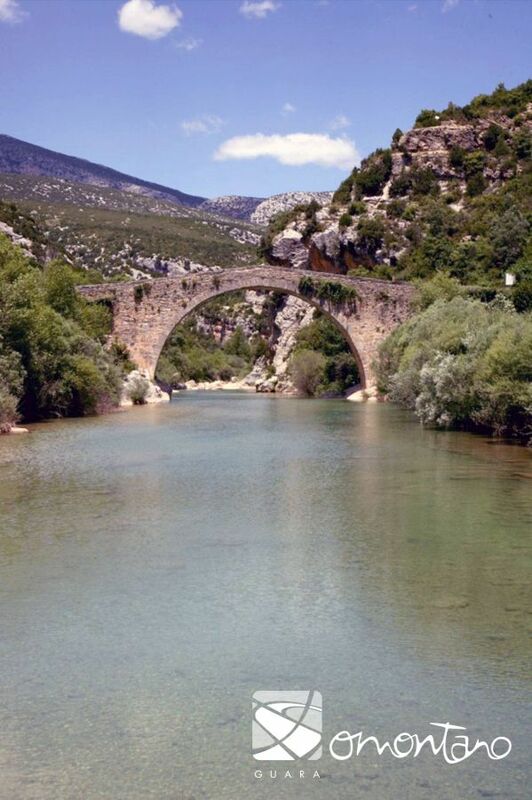 The River Alcanadre is the largest in Somontano and has a large number of ridges. 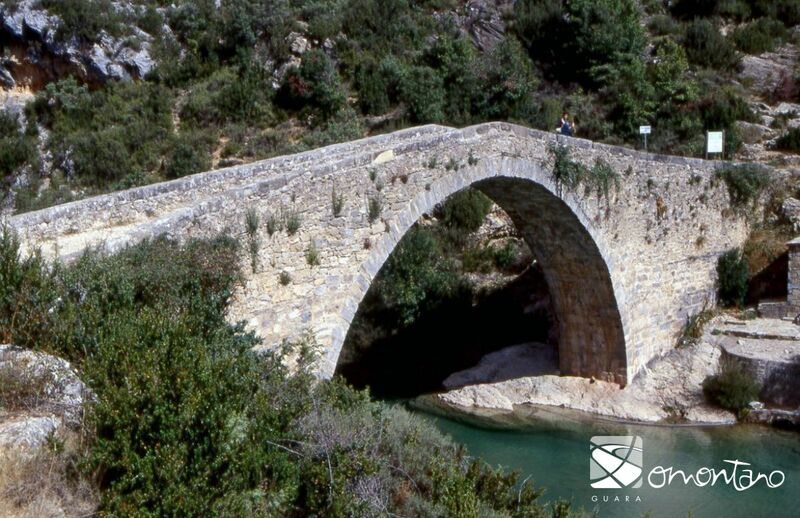 In fact its name is derived from the Arabic word al-qanatir the plural of al-cantara, meaning bridge. The art of constructing bridges has remained pretty much the same for more than 2,000 years. Stone and wood were used in a similar way in Napoleonic times as they were in the era of Julius Cesar, and as a result it isn’t always easy to find out when they were constructed. The scarcity of documented records makes it necessary to concentrate on aspects such as the shape of the voussoirs, the type of span used or the width of the deck, in order to work out the approximate era of their construction. 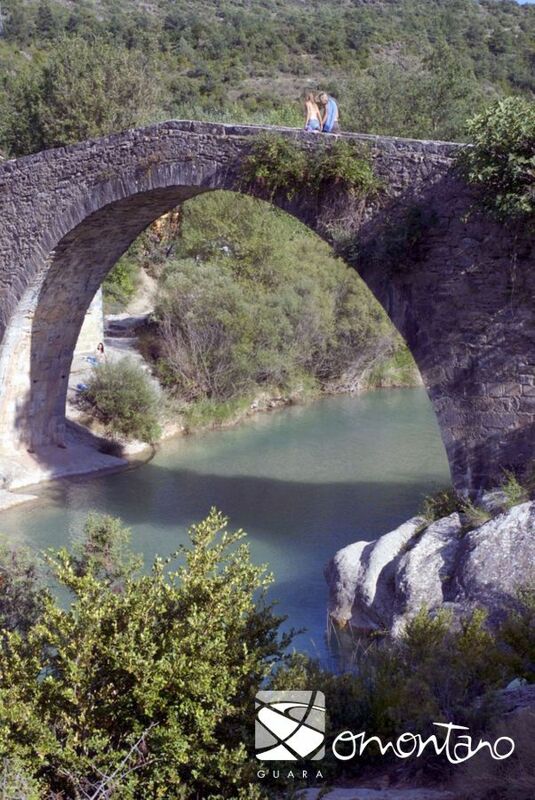 This is a medieval bridge. During that era the bridges were narrow as the paths that crossed them were also narrow. The side profiles of the deck form a “donkey’s back” shape, a typical characteristic of medieval bridges, affording them a slender silhouette. During later centuries, the deck of the bridge would be made flatter and wider to facilitate the growing use of carts and carriages. For many centuries, the arch was the distinctive element of bridges as it was the best structural system for spanning large spaces. 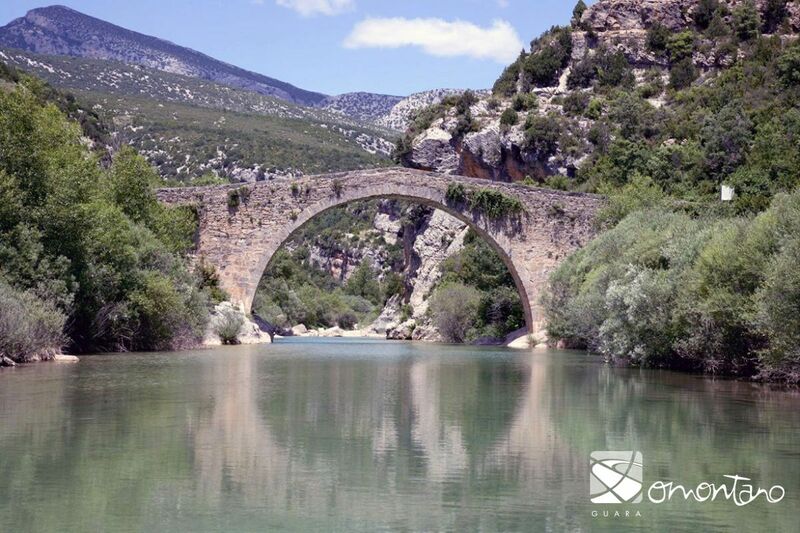 This bridge has only one span or semi-circular arch but is relatively wide.